In your status, list 10 books that have stayed with you in some way. Don’t take more than a few minutes and don’t think too hard. They don’t have to be the “right” books or great works of literature, just ones that affected you in some way. Tag 10 friends, including me so I can see your list! I followed the instructions, choosing ten books quickly to post. I was also putting my book collection back on the shelves at the same time, however, as we recently replaced carpeting in the house and everything had been in storage. This means that I came across other books that I read long ago, that influenced me greatly, that have been lost in my jumbled memory. So I thought: why stick with 10 books? In this blog post, I’ll share 20 of the books that have stayed with me for one reason or another. Going beyond my Facebook post, I’ll also described the books in some detail and explain the effect they had on me. Feel free to share some of the books that have had an effect on you in the comments, if you are so inclined! Before I begin, I should note that even this list isn’t a complete one! It is hard to choose the “most influential” books out of the many wonderful ones I’ve read. When I’ve written a blog post about the book, I link to my original post, as well. 1) The Sign of the Spider, Bertram Mitford, 1896 (Valancourt Books edition shown). Bertram Mitford was a contemporary of the more famous H. Rider Haggard, and wrote many adventure novels in a similar vein. However, Mitford’s are much darker and, I daresay, deeper. The tragic situations and flawed characters in his novels provide insight into humankind’s worst instincts. In The Sign of the Spider, Mitford introduces us to a truly horrible man named Laurence Stanninghame. Faced with an unhappy marriage, he flees England and speculates in the South African gold market. When the market crashes, he takes the only other scheme to get rich available to him: working in the slave trade. As he and his fellow slavers probe deeper into the wilds, they face increasingly perilous situations, drawing them ever closer to the mysterious tribe of the Ba-gcatya, who apparently worship a monstrous spider god! The titular spider does not disappoint, though I will not spoil any details of the encounter other than to say it was one of the most riveting passages I’ve ever read in a novel. Mitford’s unflinching look at the spiritual sickness of Stanninghame really affected me, as did his evolution throughout the book; it is not necessarily a positive evolution, and it does not necessarily have a happy ending. 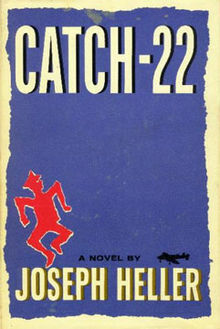 2) Catch-22, Joseph Heller, 1961. I first read Catch-22 in high school, and it is really the only assigned book I read back then that captivated and affected my easily distracted young mind. Set in Europe during World War II, it is centered on U.S. bombardier Yossarian as he attempts to not die on the endless series of missions he is sent by his vainglorious superiors. The book is at times alternately horrifying and hilarious, as Heller gives a cynical look at the mechanisms of war: the officers are far more concerned with making a profit than protecting lives or even winning the conflict. The constant humor — and it is genuinely laugh out loud hilarious — sets up a truly shocking revelation in the final fifty pages of the book, in which the true horror of the entire situation, which has been hiding in plain sight all along, is finally revealed to the reader. The terror, tragedy and misery of the entire book comes crashing down on your head all at once. But not all hope is lost: while showing the folly of war, Heller also demonstrates how one can escape it. 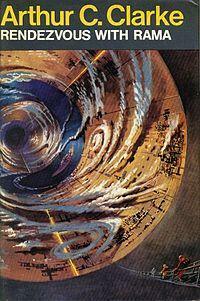 3) Rendezvous with Rama, Arthur C. Clarke, 1972. Clarke’s novel is, to me, the perfect essence of what a science fiction novel should be: a scientific voyage of discovery. When a massive, mysterious artificial structure enters the Earth’s solar system, the solar survey ship Endeavour is drafted to rendezvous with it. Penetrating to its interior, they find an entire alien world within, a world that is slowly coming to life as it gets closer to the Sun. If it maintains its course, the alien craft — dubbed Rama — will soon depart the solar system again, leaving precious little time to discover its secrets. While exploring, the Earthlings will find some answers, many more questions, and face dangers that are born of their own ignorance. In my earlier post on the novel, I described it as an “intellectual feast,” and I have found no better description since. The Earth explorers are not hunting wealth, or power, or love, but simply knowledge. Every bit of insight gleaned from the Raman craft is treated as the most precious treasure, and I have seen no better fictional depiction of what science is all about. 4) Needing Ghosts, Ramsey Campbell, 1993. Ramsey Campbell is my favorite horror author of all time. I’ve written a detailed post about his work before on this blog, though I would probably write it quite differently were I to do it again today. His writing is subtle and beautiful, proving once and for all that horror fiction is a literary genre. In many of his stories, Campbell works his magic by almost literally channeling the experience of a nightmare, and none of his stories do this better than Needing Ghosts. The story starts quite innocuously, following a writer as he wakes up in the morning and goes about doing his daily tasks. Little things go wrong at every stage of his day, however, and reading his mishaps is pretty much akin to hearing someone’s fingernails dragged repeatedly down a chalkboard. As I read, I kept hoping for some, any, relief, but none came. By the time I understood what was truly going on in the story, it had burned itself deeply into my brain. This is perhaps the only book I’ve ever read that shook me so badly that, when I finished it, I almost felt like I was going insane. I immediately had to call a friend just to recover some sense of normalcy. 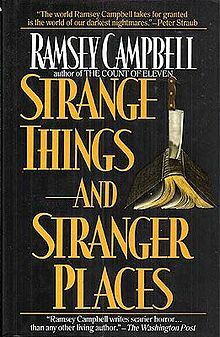 Fortunately, it isn’t a full book — it is a novella in Campbell’s collection Strange Things and Stranger Places. I don’t think I could have survived another 20 pages. 5) Solomon Kane stories, Robert E. Howard, 1928-1932. I’m really stretching the definition of “book” at this point, but Solomon Kane is worth it! 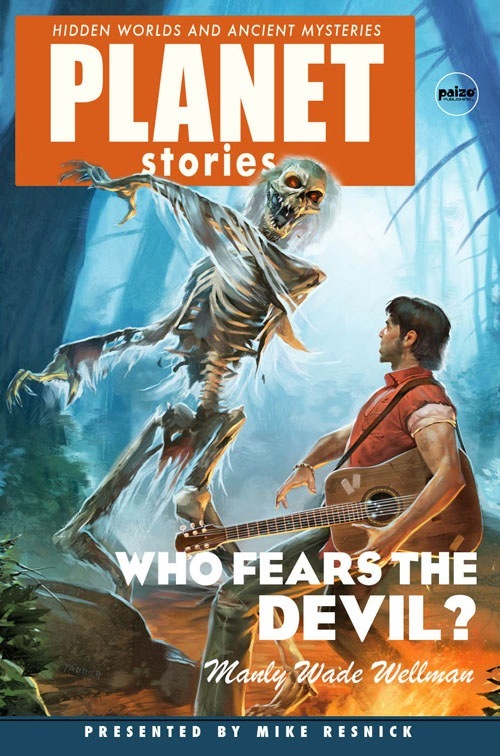 Kane, a 17th-century Puritan warrior, was featured in a series of stories by famed author Robert E. Howard, including the tale “Skulls in the Stars,” from which this blog gets its name. Kane is a religious zealot, willing to literally pursue a wrongdoer around the world to seek vengeance for the victims. When he travels to Africa in pursuit of one such criminal, however, Kane makes an ally in the tribal shaman N’longa, whose magical talents would traditionally make him the enemy of any man of God. In working with N’longa and others, Kane enters a crisis of faith, and is forced to acknowledge that there are moral shades of grey in the world. 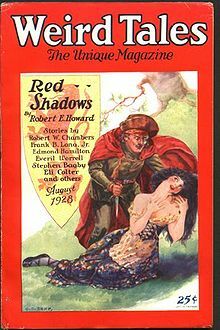 It is Kane’s confusion and doubt that makes the stories so compelling; as I have written before, they seem to be a reflection of Robert E. Howard’s own agnosticism. In the Kane stories, you can clearly see Howard struggling to find his own meaning in the world. You can also see him struggling with his inherent belief that barbarism is morally superior to “civilization”; Kane’s longing for the jungles of Africa are a literal reflection of Howard’s tendencies. Even if you don’t care about Howard’s beliefs, Solomon Kane is a badass! I can’t help but share — again — one of my favorite scenes. Warily he advanced, his eyes striving to pierce the darkness that brooded under the trees… Then his hand fell away from the hilt and he leaned forward. Death indeed was there, but not in such shape as might cause him fear. “You – who are – you?” her words came in gasps. “Naught but a wanderer, a landless man, but a friend to all in need.” The gentle voice sounded somehow incongruous, coming from the man. The girl sought to prop herself up on her elbow, and instantly he knelt and raised her to a sitting position… His hand touched her breast and came away red and wet. “Tell me.” His voice was soft, soothing, as one speaks to a babe. “I ran. He, the Wolf, pursued me – and – caught me -” The words died away in a shuddering silence. Slowly he rose, mechanically, wiping his hands upon his cloak. A dark scowl had settled on his somber brow. Yet he made no wild, reckless vow, swore no oath by saints or devils. “Men shall die for this,” he said coldly. Kane goes into a fanatical, murderous rage when he finds that innocents have been harmed; this attitude resonates strongly within me. 6) How Did We Find Out About Black Holes? Isaac Asimov, 1978. I first read this book in first or second grade and, though it is essentially a kid’s book, I still have it on my shelf today. Why do I still have it? 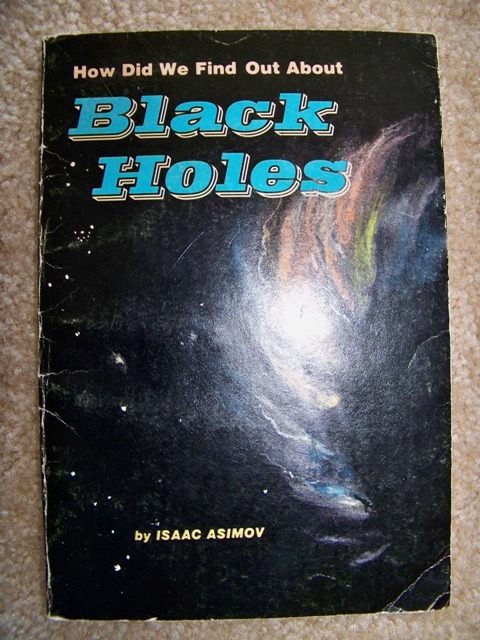 Asimov takes complicated, mind-bending phenomena — black holes, neutron stars, white dwarfs — and weaves a wonderfully clear and captivating historical story about them. 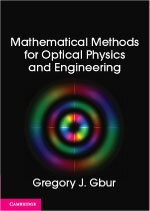 This book was perhaps the first that really made me curious about science. 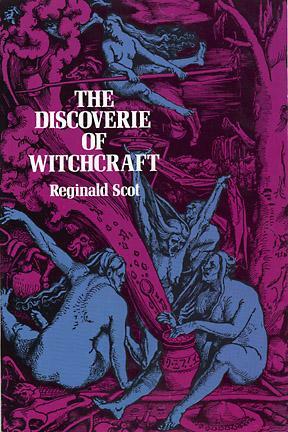 7) The Discoverie of Witchcraft, Reginald Scot, 1584. I originally bought this book on a whim in Salem, Massachusetts probably close to two decades ago, long before I had any serious interest in the history of science or science communication. The concept intrigued me, but I didn’t get around to reading it for years. Why not? Well, the biggest obstacle is that Discoverie is written in archaic 16th century English which can be quite a challenge to read. But once I did start reading, I discovered one of the most amazing and moving books I’ve ever read. Discoverie is Scot’s argument against the existence of witchcraft and against the cruel and dishonest tactics of supposed witch hunters. Over the years prior to writing, Scot had seen the effects of witch trials in his own communities and the executions that followed; he even defended, successfully, one witch in court. His experiences convinced him that witchcraft is nonsense, and witch trials completely unjust. Discoverie is a multi-pronged attack on the belief in witches, and he attacks it from naturalistic, psychological, legal, practical, and even religious points of view. He even goes so far as to explain how many supposedly “magic” tricks are performed, making Scot’s book one of the first references for would-be illusionists. It is important to note that this book was written nearly 100 years before Newton’s Principia and what is arguably the beginning of modern science. Scot’s compassion and reason shine forth like a star in the darkness of space, a standout in an era filled with superstition and cruelty. In spite of the antiquated English, I found myself riveted by every word Scot wrote. Though his work did not stop the trying of witches, it stands as a testament that some in his era were truly magnificent humans. 8) Pegãna, Lord Dunsany, 1905-1906. I first learned of Lord Dunsany’s writings because of my fondness for the work of H.P. Lovecraft. Lovecraft, who crafted not only elegant stories but a consistent universe tying them together, inspired generations of writers to do the same. 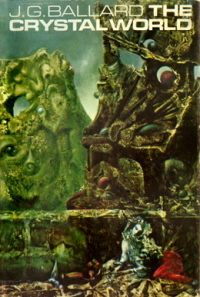 Lovecraft, in turn, was inspired by Dunsany’s Pegãna. Collected in two books and several independent stories, Dunsany crafted an entire mythology about his world Pegãna, created by the deity MANA-YOOD-SUSHAI and to be destroyed by the same when he awakens. The early tales of Pegãna are quite simple, but they evolve in complexity and become powerfully ironic. Dunsany was agnostic or atheistic, and his tales of the gods begin to reflect the multitude of flaws in the concept of a god. This culminates, for me, in his story The Men of Yarnith. I still vividly remember reading this story for the first time. It starts very much like every other parable, but takes an incredible turn to become one of the most beautiful stories of faith in humanity, and not gods, that I’ve ever seen. I reproduced it in its entirety in my post on Pegãna, for those who wish to read it. Critics of atheism often claim that it provides no purpose for life and no morality. For me, Dunsany’s Pegãna proves them wrong. 9) The Metal Monster, A. Merritt, 1920. 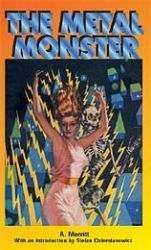 The Metal Monster is another novel that H.P. Lovecraft thought highly of; it was reprinted in 2002 by Hippocampus Press in its complete form for the first time since it was originally published as a serial. The main narrative starts out like an ordinary pulp fiction novel: westerners exploring the trans Himalayan mountains near Tibet run afoul of lost tribe of Persian warriors. When they are about to be captured, however, they are rescued by a mysterious woman who seems to have at her command an army of intelligent, metallic geometric shapes. She destroys the warrior party easily, and takes the explorers under her protection. “Dominion over the earth? Yes — as long as man is fit to rule; no longer. Science had warned us. Where was the mammal when the giant reptiles reigned? Slinking hidden and afraid in the dark and secret places. Yet man sprang from these skulking mammals. “For how long a time in the history of the earth has man been master of it? For a breath — for a cloud’s passing! And will remain master only until something grown stronger than he wrests mastery from him — even as he wrested it from his ravening kind — as they took it from the reptiles — as did the reptiles from the giant saurians — which snatched it from the nightmare rulers of the Triassic — and so down to whatever held sway in the murk of earth dawn! “Life! Life! Life! Life everywhere struggling for completion! Life crowding other life aside, battling for its moment of supremacy, gaining it, holding it for one rise and fall of the wings of time beating through eternity — and then — hurled down, trampled under the feet of another straining life whose hour has struck! It is this sense of the cosmic that makes The Metal Monster stand out so dramatically in my mind. Merritt manages to capture and convey the feeling that humankind is completely insignificant in the scope of nature and the universe. The scenes featuring the monster — really a hive collective — are breathtaking in their beauty. There has never been a monster quite like this one. 10) Who Fears the Devil? Manly Wade Wellman, 1963. A lot of city folk like myself are burdened with negative stereotypes of rural communities. Wellman’s stories about the character of Silver John are the perfect antidote, presenting a folk hero who is intelligent, brave and kind, yet firmly grounded in his Appalachian mountain home. Silver John — so named because of the silver strings on the guitar he carries with him everywhere — is a modern folk hero crafted from the mind of Manly Wade Wellman. John is a wanderer, rarely staying long in one place, and in his travels he invariably runs into people in trouble and risks his own neck to help them out. Where modern American heroes typically solve problems with a gun, Silver John uses his wits, his fists, and his music. He is genuinely selfless, and has little need for money or power, as those who try and corrupt him quickly learn. He is also extremely well-read, and John regularly confounds the expectations of those who assume he must be ignorant or even stupid. The stories themselves are beautiful, featuring some of the unique legendary monsters of Appalachia, including the Behinder, a creature that nobody’s ever seen because it always gets its prey from behind. The tales feel primal, and tap into feelings that I often forget I have. Manly Wade Wellman’s Silver John stories are a rare group that actually make me feel hope. 11) Last Chance to See, Douglas Adams, 1990. 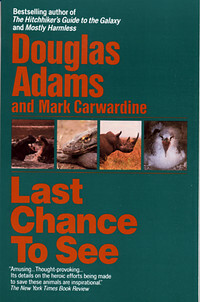 In 1989, Douglas Adams and naturalist Mark Carwardine traveled the world for a BBC documentary, seeking out some of the most critically endangered species in the world. Some of those species are now, in fact, extinct, making the title of the documentary and the book that followed horribly accurate. You might expect such a story to be incredibly depressing. The book, however, is written by the late Douglas Adams, most famous for the Hitchhiker’s Guide to the Galaxy novels, and it is hilarious and poignant, sometimes simultaneously. Though Adams is not a scientist, his writing is filled with remarkable insights into the relationship between humans and nature, not to mention hilarious commentary on human society. The book ends with a parable that has stuck with me for years, and which I could recite easily from memory, in my own words. 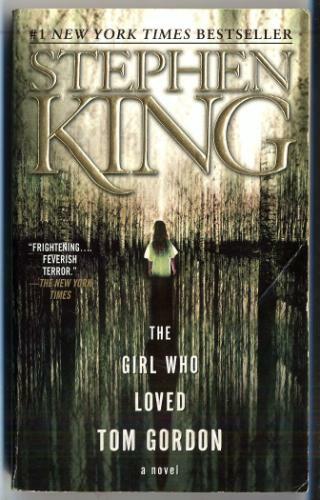 12) The Girl Who Loved Tom Gordon, Stephen King, 2000. In spite of being one of his shortest novels — or perhaps because it is — King’s Tom Gordon is a thoroughly engaging and emotional journey. When nine-year-old Trisha McFarland tires of the fighting between her brother and mother on a hike in the wilds of Maine, she steps off the trail momentarily — and becomes hopelessly lost. Almost immediately, Trisha is fighting to survive in an unforgiving wilderness, her only companion a radio on which she can hear Boston Red Sox games involving her hero, relief pitcher Tom Gordon. Not only does she have to worry about food and shelter, she must also contend with a sinister creature that is stalking her through the forest. Tom Gordon is what some might call existential horror, but I often refer to as “aging horror” — it embodies the fears and anxieties of all humans as we grow older. Why are we here? What does life mean? Why should we even bother? Stephen King seems to have written more stories asking about the meaning of existence, or lack thereof, as he’s grown older, and these stories are wonderful food for thought. In this specific case, the tale is even more poignant because it is told through the eyes of a nine-year-old girl. 13) The Crystal World, J.G. Ballard, 1966. J.G. Ballard is best known these days for his twisted 1973 novel Crash, about fetishists who get sexual gratification from car crashes. Before this, however, he was the king of disaster novels, writing a series of stories that explored humanity’s reaction to a variety of apocalyptic scenarios — worldwide hurricanes, floods, droughts. I still have to read most of these, but the last of the series — The Crystal World — is perhaps the most ominous, looking at a destruction on a potentially universal scale. This revelation does not come until later in the novel, however. As the story begins, Dr. Edward Sanders has traveled to the remote town of Mont Royal in the African interior at the mysterious invitation of a pair of old friends. What he finds is a region under quarantine — a massive swath of the jungle has succumbed to a mysterious disease that causes anything within it to become beautiful, but lifeless, crystal. And the region is growing, inexorably and rapidly. As with most good novels of the end of the world, the details of the destruction are secondary to the details of how humans cope with it. As I described it previously, “The novel is a haunting look at people coming to terms psychologically with their imminent destruction.” The characters are just as concerned with their own personal problems as they are with their impending doom. 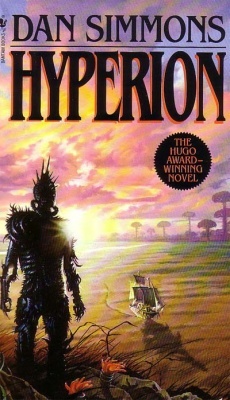 14) Hyperion, Dan Simmons, 1989. In the 28th century, a small group of pilgrims have traveled to the remote colony world of Hyperion, each pilgrim with his or her own secrets and literal wish to be fulfilled. They are journeying to the Time Tombs, a mysterious and ancient (?) series of structures that are apparently traveling backwards in time and will open at some unspecified point in the future. The pilgrims all know the legend of the Shrike, a cruel but seemingly godlike being that will occasionally grant the wish of a pilgrim — and slaughter the rest. On the journey, the pilgrims share their stories, and this is what the novel is concerned with. These stories are beautiful and poignant. Using the same structure of the classic Canterbury Tales, Simmons presents musings on the meaning of existence, the cruelty of life, and more. One tale in particular — The Scholar’s Tale — has stuck with me through the years since I first read the novel. Hyperion ends on a cliffhanger, with the pilgrims arriving at the Tombs. The story is concluded in its sequel, The Fall of Hyperion, which resolves the various subplots but does not completely capture the magic of the original. 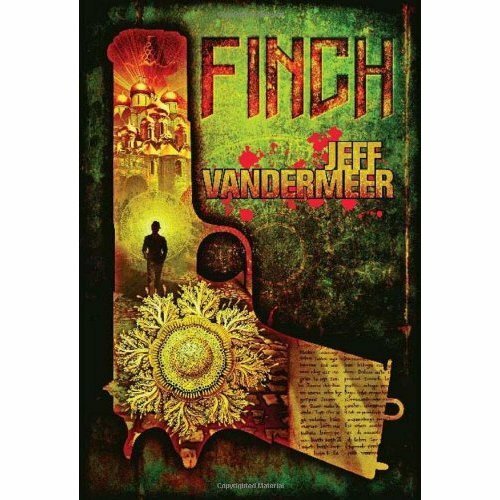 15) Finch, Jeff VanderMeer, 2009. This book haunted my imagination long before I even read it. The description of the book was enough for me: the fictional city of Ambergris is under brutal occupation by a race of fungoid beings, the Gray Caps, who have imprisoned dissidents, destroyed resistance, and enlisted humans as spies, collaborators and police. In the meantime, the city itself is slowly being engulfed in fungi itself. This nightmare resonates with me strongly, and I’m not even sure why. Into this nightmare comes Finch, a man with a hidden past that would get him killed if the Gray Caps learned of it. Finch works as a “detective” for the Gray Caps, and as the novel begins he is called in to investigate a particularly baffling crime scene. The deaths have the fungal creatures worried, and there is a sense of urgency to the case in light of a strange, technological structure that they have recently been constructing. Finch is the third book in a trilogy about Ambergris, following City of Saints and Madmen and Shriek: An Afterword. I had not read these before Finch, and I almost feel like my experience was enhanced: Ambergris seemed that much more mysterious. The novel is beautiful, horrific, mysterious, and tragic. It is one of my favorite novels of all time. 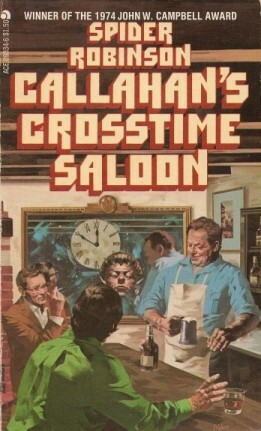 16) Callahan’s Crosstime Saloon, Spider Robinson, 1977+. 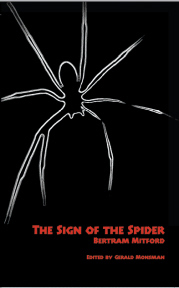 This epic series started as a single short story published in Analog Magazine, “The Guy with the Eyes.” In it, Spider Robinson told a science fiction story, but he also introduced us to one of the greatest settings of all time: Callahan’s, a bar that is more than it seems and holds solidarity, friendship and redemption for all those who seek it. Much like Wellman’s Silver John stories mentioned earlier, the Callahan stories show you a world in which fundamentally good people exist, and problems can be solved with wits and empathy. The stories are sentimental and at times not a little sappy, but they are also quite funny! As the overarching title suggests, science fiction runs rampant through the stories, from aliens to time-travelers to vampires to artificial intelligence. The science fiction, however, is secondary to the overall themes of forgiveness and empathy. If you read through the series in its entirety, you will find Spider Robinson makes you feel sympathetic for people who, in real life, you would consider abominations. 17) Blood Work, Holly Tucker, 2011. 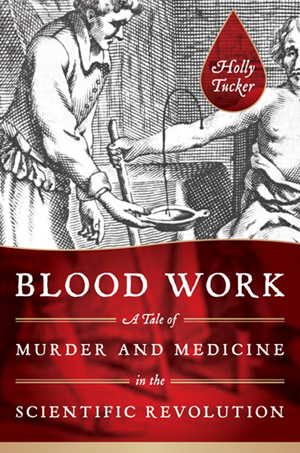 This fascinating non-fiction book tells the story of the first attempts at blood transfusion in 17th century England, attempts that ended with the death of a patient and the banning of such techniques for well over two hundred years. The early parts of the book are interesting, but come across as nothing spectacular — but this just allows the reader to be blindsided by a (true) revelation that is so horrific and stunning that I was quite speechless when I first read it. Tucker has uncovered a monstrous conspiracy, and one that literally changed the course of history… for the worse. 18) Exogene, T.C. McCarthy, 2012. 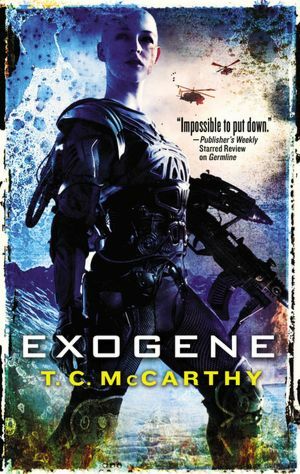 Exogene is the second book in the Subterrene War trilogy by McCarthy, and all three books are intense, realistic, and moving. They depict a war on Earth in the near future that will permanently influence humanity. Of these, Exogene is the one that gave me the most chills. Following the life of a genetically-bred American soldier, essentially a cloned teenage girl bred to kill, we see her fight and eventually flee for her life, violating the religious prescription that all Germline soldiers are to be killed at age 18. Catherine, as she is named, flees into lawless territory and eventually into the domain of the enemy Russian forces. It is with the Russian forces that one really gets the feeling that war and science are a Pandora’s Box of sorts, introducing technology that will change the world for the worse and cannot be contained again. In the 1950s, that technology was nuclear power: in Exogene, genetic engineering is the danger. I would not say that this is the big theme of the novel, or even what McCarthy intended, but the images and ideas he presented have haunted me for some time. 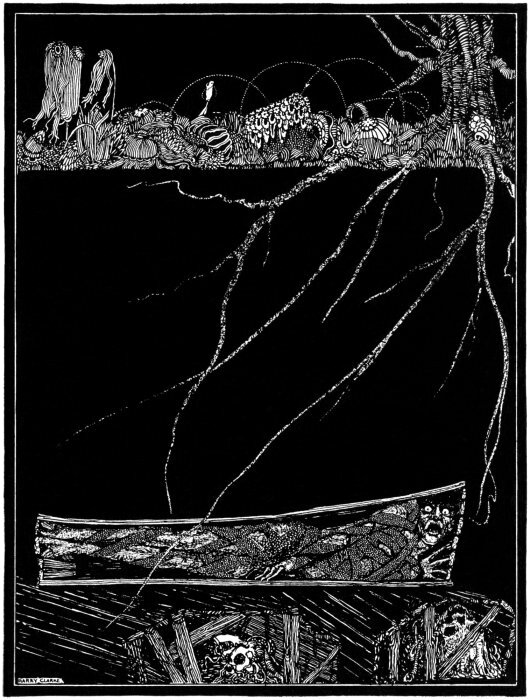 Image of The Premature Burial by Harry Clarke, published in a 1916 edition of Poe’s works. Via Wikipedia. 19) The Premature Burial, Edgar Allan Poe, 1844. Now I’m down to a single short story as one of my most “influential books,” but this one is huge to me. Poe is known for his stories of horror, jealousy and revenge: in fact, for stories about the worst aspect of humanity. Here follows a bit of a spoiler. If you’ve never read it before, “The Premature Burial” is in fact a story about overcoming fear. The narrator, who lives in terror of being buried alive, ends up in a situation where he believes he has suffered that fate. The shock makes him realize that he is the source of his own suffering and, casting away his fears, he becomes truly happy again. The story is, in fact, inspiring, and must have shocked people when they first read it, perhaps more than a true horror story would have. Poe himself seems to have had at least a mild fear of premature burial himself, as many of his stories feature it, and The Premature Burial seems to have been Poe’s own way of facing his demons. I found this stunning and inspiring, and the tale has stayed with me ever since. 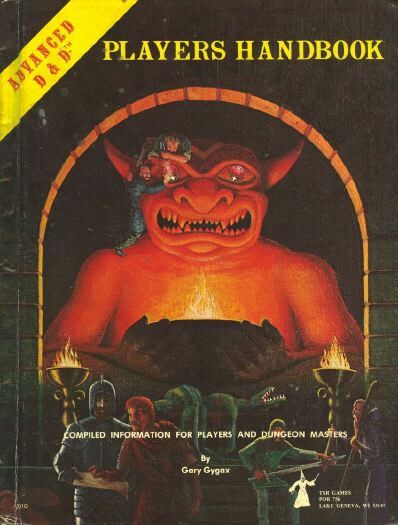 20) Advanced Dungeons & Dragons, Gary Gygax, 1977-1979. This is an odd choice, but after I thought about it for a while, there was hardly any other that made sense! I played Advanced Dungeons & Dragons for the better part of a decade, and the experience molded me and made me who I am today. No, I didn’t turn into a Satan-worshipping serial killer! In fact, AD&D gave me a number of positive qualities. One of these was a love for, and intuitive feel for, mathematical calculations: nothing teaches math better than needing to calculate the odds of survival against an umber hulk! More important than that, however, was the experience AD&D gave me in crafting a story, and the exercise for my imagination that came with it. I was typically the Dungeon Master in the games, and I devised countless characters and adventures for my friends to encounter. Despite what the Christian fundamentalists will tell you, Dungeons & Dragons taught me to use my brain. On second thought, though, perhaps that is what they fear more than anything? That’s my overly long list of books that have stayed with me! 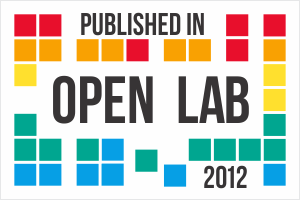 If you feel like sharing some of your own, and why, you are welcome to do so in the comments! I have only read one of the books on your list. (I don’t read nearly as much sci-fi as a lot of my geek friends do.) But Catch-22, the one we have in common, would definitely make my list if I made one. I read it in grad school and again a year or so ago, and the last 50 pages hit me way harder this most recent time. What an amazingly crafted book. Really interesting list. I’m particularly interested in reading Holly Tucker’s Blood Work after this. And thanks for the inspiration. I’ve gone and done my own list now on my blog! Thanks! And your list is very interesting, too!